Discussion in 'Fan Fiction' started by Bry_Sinclair, Nov 1, 2018. DarKush and Bry_Sinclair like this. Shout out to one of my favorite shows! Admittedly, that's where inspiration came from--well that and a healthy dose of TLR's Border Service. I loved the small ship and crew setting, as it ups the stakes and allows for some interesting crew dynamics. I mean, yeah, sure, these are really cool names. The problem is, pretty soon you're gone to run out of descriptive words. I'm not saying "Don't use them", but I'd still plan on using names like Wyatt Earp and Doc Holiday for the vast majority of these boats. That's only necessary if Bry intends to feature every ship of the class in the stories, which wouldn't make sense. The stories will focus on, as usual, one ship and one crew, so you really only need two names: Class Name and Unit Name (and only one if the Unit is also first-in-class). In all likellihood, you will never see more than a handful of the other ships in the class in the stories anyway. If that's the case, then the Sentinel-related names already mentioned in the thread will be plenty. Going out of the way to anticipate the moment you run out of Sentinel-related words in the dictionary is overthinking of the highest order. From a storytelling standpoint, it is completely unnecessary. Yes and no. I know that Bry likes to make notes about his universe that never makes into any story. And while the setting will be on one single ship, it's highly likely that other ships would be mentioned from time to time. It's his world, of course. In my world, cutters will number in the hundred (400-600), but patrol skiff will number in the thousands (possibly 10,000+) and thus will have numbers but not official names. With the region they're patrolling being along the Kzinti Patriarchy, whose forces are restricted by treaty, Starfleets forces are light (their main concern is with smugglers, pirates and other such criminals). There are a couple of other species in the area with small holdings, but they are either less advanced than the Federation or not regarded as hostile. The unit attached to patrol compromises of about 10 patrol boats, 2-3 cutters and an asteroid breaker/warp tug, with 6 stations to support the ships and as permanent watchtowers of the border. Okay, so you're done. With that you officially have everything you need to start telling stories. You got the ship, the characters, the premise, the setting and all the names you'll ever need for the cameos from other ships in the detachment, and all of it's right here in this thread. Your prep is complete. Start writing. Been at a conference for work the last couple of days, but when I get back home tomorrow I'll be hammering away on the trusty laptop (been scribbling story ideas and plot points down in the back of my notebook during the more tedious talks). admiralelm11 and Admiral2 like this. By the way, do you have a description of what your ship looks like? Or better yet, an image of some sort? 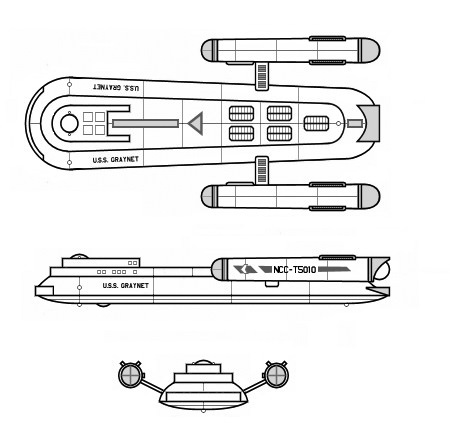 This would have a similar weapons suite (one photon tube / three phasers) and crew complement (about 100), and fill the same roll, as the Callaghan-class Cutter above. 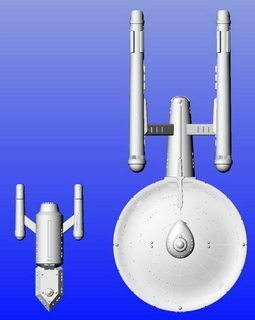 Another option would be to go with a saucer design, like the SFB 95-meter Fed Burke-class Frigate, but noticable smaller at about 70-80 meters in diameter.